Most of the data reported in the beer media comes from off-premise. This makes sense for a couple of reasons. First, off-premise is more than 80 percent of overall beer volume. Secondly, the data is easier to obtain, thanks to the magic of the barcode and sophisticated scanner systems. On-premise data does exist–but POS systems are generally less reliable than scanners, and on-premise is less concentrated, making data gathering more difficult. The lack of comprehensive on-premise data creates particular challenges for craft brewers in understanding the marketplace, with around 35 percent of craft’s volume coming via on-premise channels. These challenges are particularly acute for the smallest brewers. Brewpubs less than 1,000 barrels have production that is 95 percent draught (median 99 percent), and production brewers less than 1,000 barrels are on average 89 percent draught (median 100 percent). Overall, the median brewery surveyed in our 2014 benchmarking survey had 78 percent draught production. So without comprehensive on-premise data, what clues can we glean from other data sources about the on-premise market, its future and what that means for craft brewers? 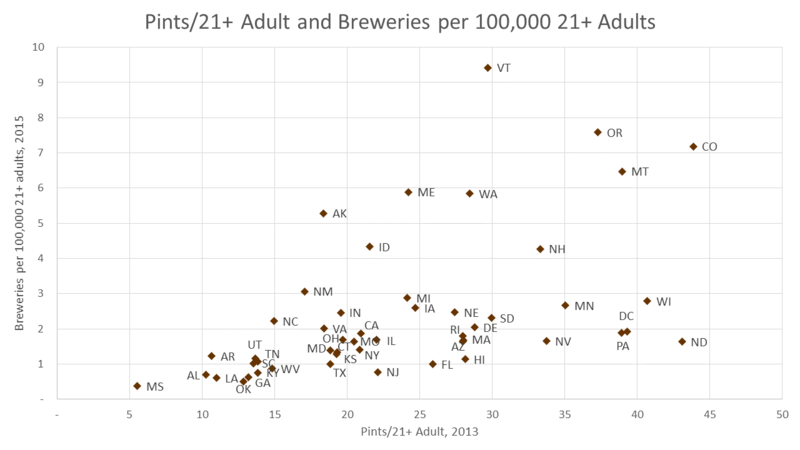 The first note is that the size of the on-premise beer market varies wildly by state. This is due to a variety of factors: beer’s share of beverage alcohol, overall beer consumption levels, number of on-premise outlets, on-premise culture, consumer preferences and socioeconomic factors. 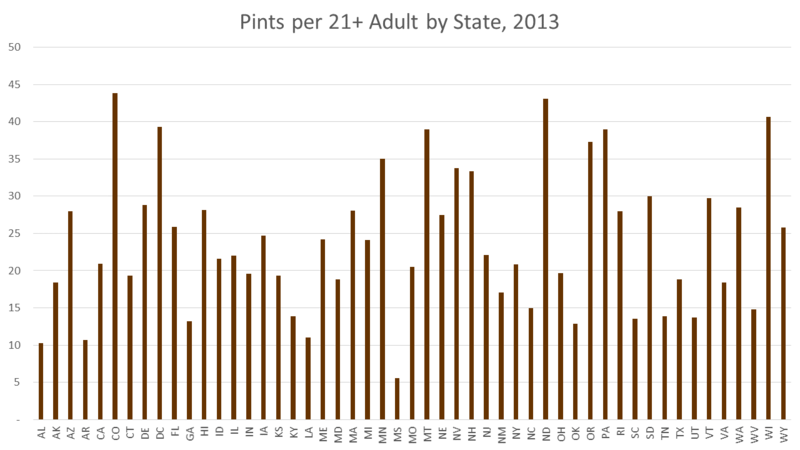 Below is a graph of the total draught beer market by state in 2013 (from the Beer Institute) measured in pints per 21+ adult. As you can see, the variations are pretty huge, ranging from almost 44 pints per 21+ adult in Colorado to 5.5 pints per 21+ adult in Mississippi. Given the lower barrier to entries for many brewers in on-premise, this immediately suggests one clear driver of different levels of breweries per capita, the size of the on-premise market. To see this visually, here’s a graph of the number of craft breweries per capita in 2015 and the pints per capita in 2013 (latest year available). In crunching the numbers, the size of the on-premise beer market appears to be far more important for brewery per capita numbers than the size of the overall beer market. Neither off-premise or total beer shipment volumes are statistically significant as independent variables when placed in a multiple regression with on-premise volume and breweries per capita as the dependent variable whereas on-premise volume is highly significant (and the overall models are great fits for the data with an r-squared = 0.7, meaning they can explain about 70% of the variation). In layman’s terms, that means when you know both the size of the draught market in a state and the size of the total beer market, the size of the draught market is a much better predictor of the number of small and independent breweries. The importance of the on-premise for craft brewers doesn’t stop there. There is also evidence that the old maxim, “brands are built in the on-premise,” has been true in the aggregate for craft. 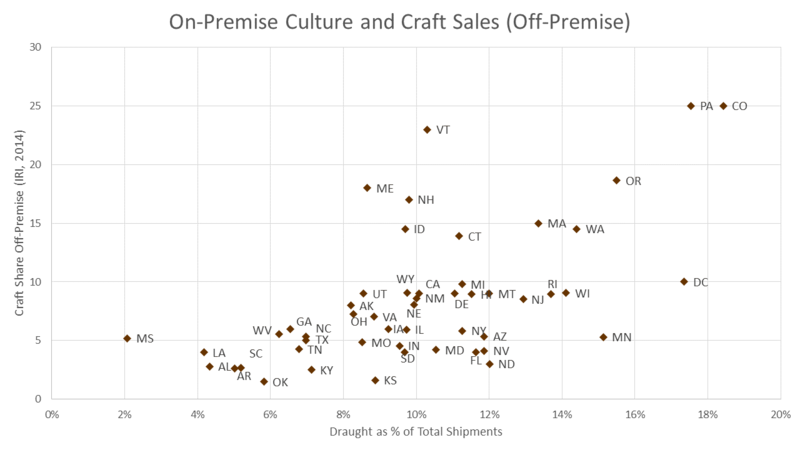 The data suggest that states where on-premise is more important to the beer market, craft does better in the off-premise. The logic is fairly simply: in places where more beer lovers are in bars and restaurants drinking beer and thus encountering craft, off-premise locations have better sales for craft brewers as well. As a closing set of thoughts, it will be interesting to watch how these dynamics play out going forward. The on-premise market has shifted over of the past few years, with the continued spread of “rotation nation” and an increasingly fractured and competitive market for tap handles. 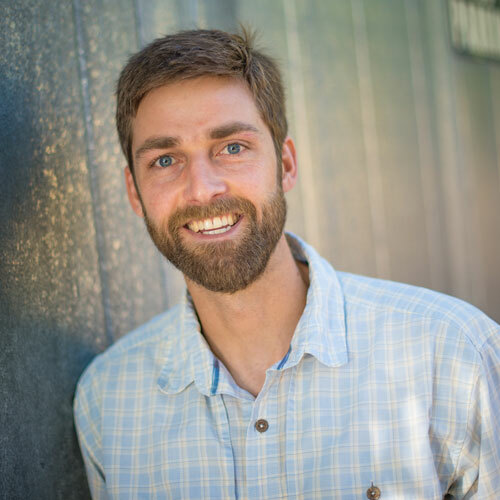 Although this will vary by brewer, this has likely created some challenges for regional craft brewers, the companies that are typically doing the heavy lifting in off-premise channels. Given the greater dominance of chains in off-premise, those channels will likely never reach the diversity we are seeing in on-premise markets. Given these different dynamics, it raises the question of whether historic pathways to growth will still exist, or if we will see more regional craft brewers building their brands through off-premise.